Paddy Power has launched its first campaign under new CMO Gav Thompson, with a TV spot and the new tagline "You're Welcome!" The campaign kicks off on 5 August, with the TV ad part of a wider campaign highlighting Paddy Power's generosity to customers. 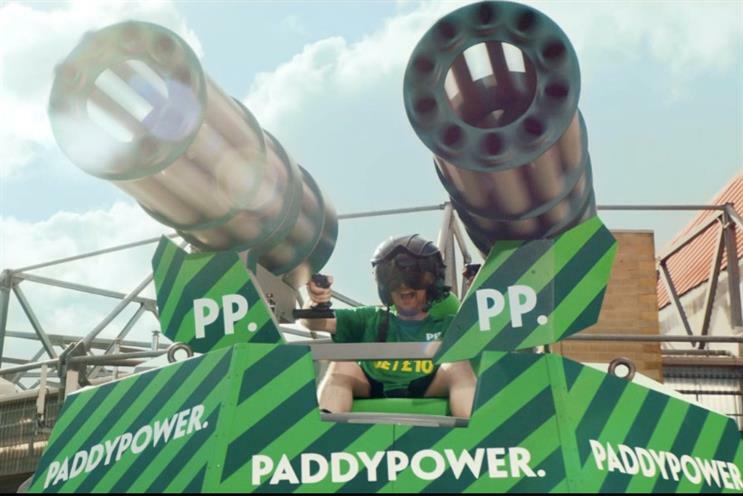 The ad focuses on an offer for bets made on Premier League matches, and shows the brand using a 26-barrel cannon to fire out free Paddy Power-branded t-shirts to footie fans standing outside a stadium. The ad concludes with the tongue-in-cheek strapline"You’re Welcome", after the cannon takes out footballers, fans and a burger van. Paddy Power promised more "outrageous generosity" as the campaign develops online, in store, print and radio. The campaign is the first after Lucky Generals was appointed Paddy Power’s lead creative agency. New CMO Gav Thompson, also the founder of GiffGaff, was appointed in April to replace Christian Woolfenden, who was promoted. Thompson said: "The Paddy Power brand has always been about two things - being as generous as we can with our customers, and behaving in a mischievous way. "With our new campaign we plan to unite these two attributes. Our first ad with our new agency partners, Lucky Generals, celebrates the start of the footie season with a typical show of outrageous generosity. There will be plenty more where this came from."